Open enrollment strikes every year from October 15 to December 7. While a retiree can get a Medicare Supplement (Medigap) plan and stick with it for 3 to 4 years without needing to revisit it, Prescription Drug plans are another story. Prescription Drug plans, or Part D plans, need to be revisited every year because insurers frequently change the availability and price of drugs. 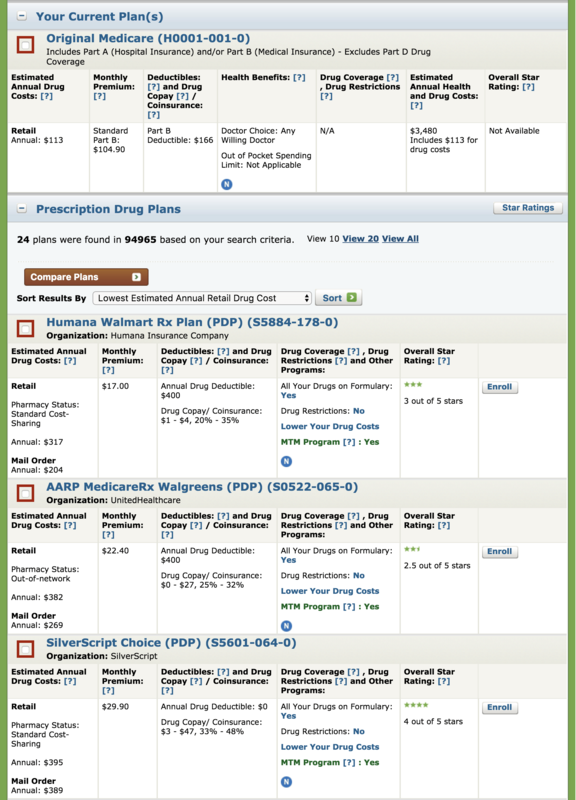 I’m retiring after having sold health insurance since 1978, and I find Prescription RX help to be the one service my clients say they’ll miss the most, so I’ve put together a short tutorial for how to use the Medicare Plan Finder on the Medicare.gov website to find a prescription drug plan that fits your needs. This is exactly what I do, and so now you can do it too, either for yourself or for an elderly loved one. If you can, sit by a computer and click along. If you have a Medicare Advantage plan, then you probably have your Prescription RX as part of your plan and don’t need to read this. 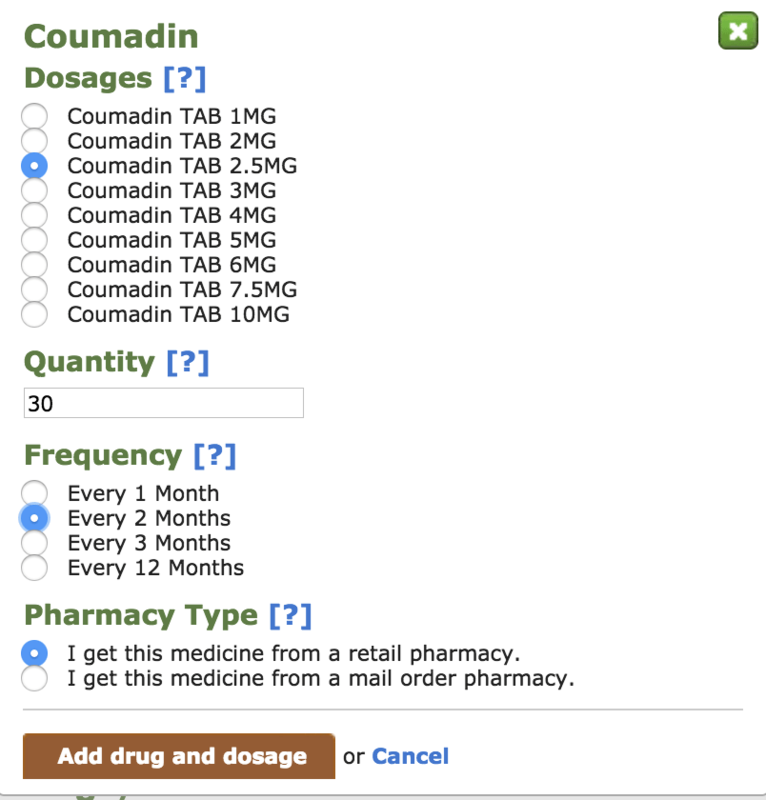 Click on “Drug Coverage (Part D)” in the blue menu at the top. 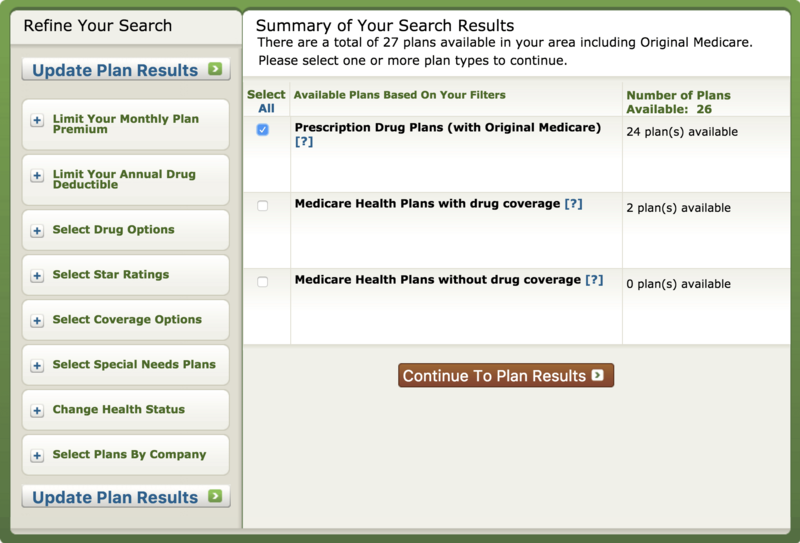 In the drop down menu, choose “Find Health and Drug Plans,” the last item in the menu. 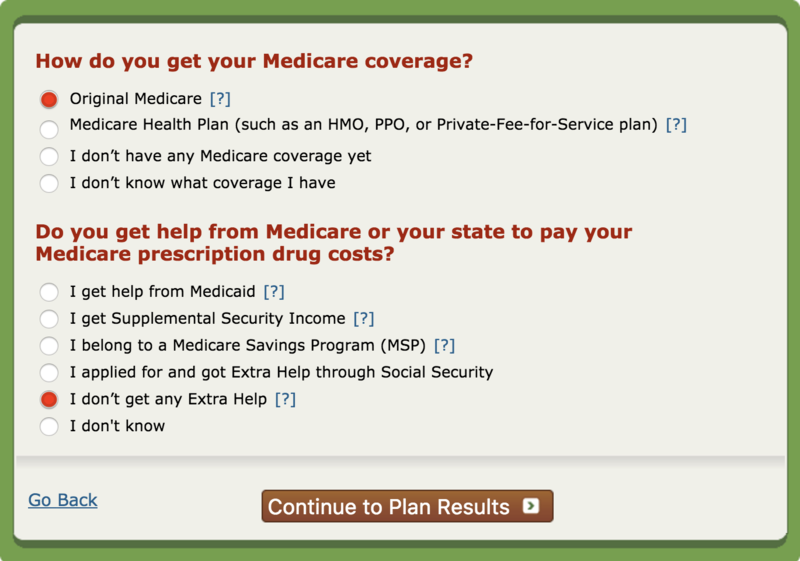 Shortcut: Click on this link to go directly to the Medicare Plan Finder Page. STEP 2 of 4: Enter your drugs. Type the name of your drug in the field provided. 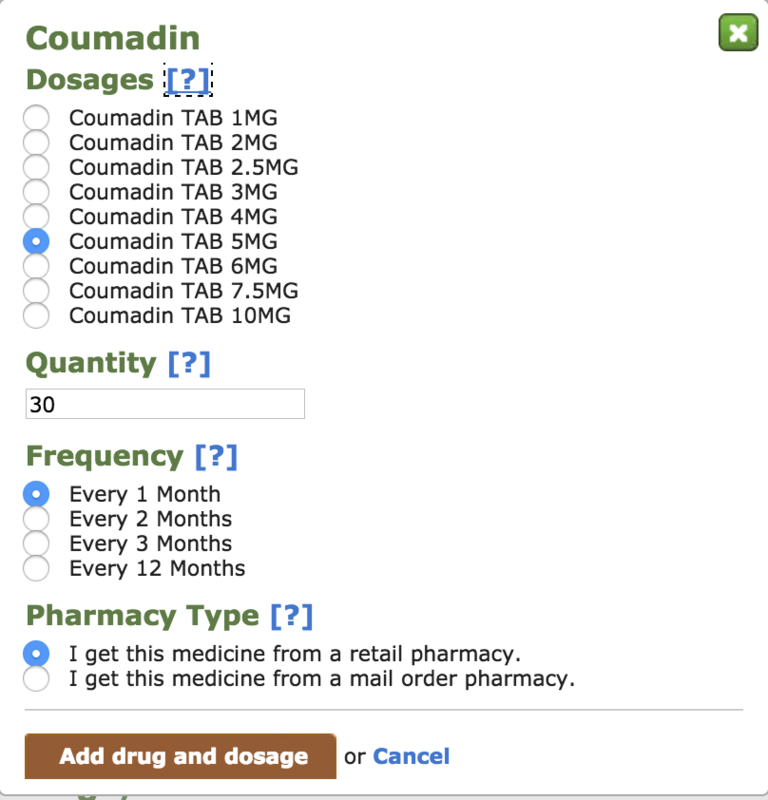 Note that all you need to do is type in the first few letters and a drop-down list will appear and you can choose the right drug from there. Suddenly, a lot of information shows up. Note that on this page you have the Medicine Name, the Quantity, the Frequency & Pharmacy, and the Generic Option. 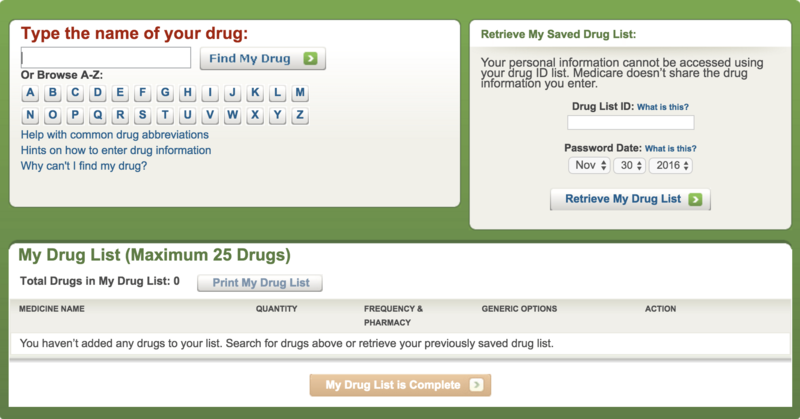 More importantly, do not miss that you have now a box called “RETRIEVE MY SAVED DRUG LIST” on the right side. RIGHT NOW, cut and paste that Drug List ID number somewhere safe because you will definitely need it… no need to lose it after all this much work! ALSO CHANGE THE PASSWORD DATE. Once you get this drug list attached to your social security number, the Password Date, if it stays as the default, will be whatever date you managed to first start the list. (Not user friendly.) Change it to your date of marriage, birthday, or anything you can remember. 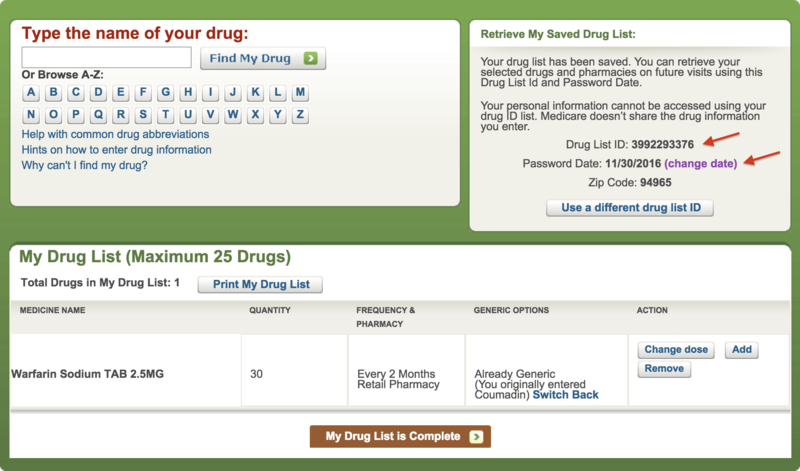 For our purposes, let’s just click “My Drug List is Complete” and go to Step Three. 1) First, click on the “Star Ratings” button on the right. Each of the question marks beside the row of categories shows you what they are measuring. I always check the way the plans handle member complaints: “This category shows how often members have problems and how often they chose to leave the plan. It also shows how much a health plan’s performance has improved (if at all) over time.” Don’t think of this as a type of Yelp for plans, though, because the government takes Star Ratings very seriously. Drug companies are dropped if they have low star ratings without improvement. Even in choosing a Medicare Plan, a 5-star rating gives a company the right to add people any month, not just at Open Enrollment. (Examples include Medicare Advantage plans Providence in Oregon and Kaiser in California). 2) Once you have reviewed the Star ratings, click the “Return to Previous Page” box at the top. 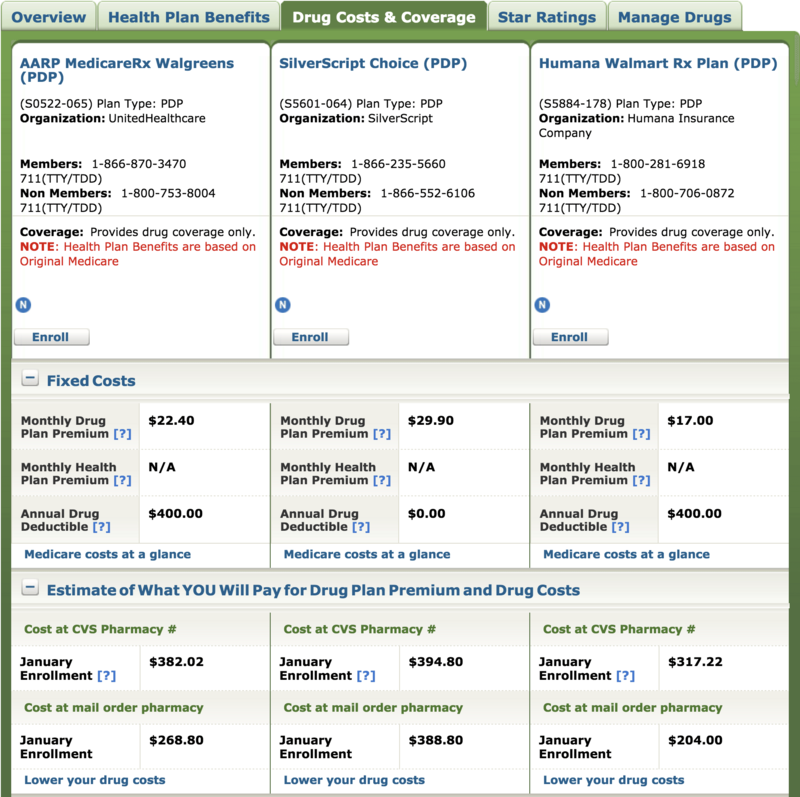 Back at “Prescription Drug Plans,” note that the “Compare Plans” default is “Lowest Estimated Annual Retail Drug Cost.” For once, the government got it right. Good default … you don’t care so much what the premium is, or what the deductible is, or even what each specific drug costs … what you want to know is the amount you will pay over the course of the year on the prescriptions you have now. Click “Sort” and now you finally have plans and pricing! There you have it. Choose a plan, click “Enroll,” and you are done. The new plan will inform the old plan of your change, and most people choose to have the premium deducted from their social security monthly payments. You can take it from here. Good luck and best wishes! Susan Lundy received her doctorate (Ph.D.) in Communication Theory from the University of Iowa and her Chartered Life Underwriter (CLU) degree from the American University. Susan works with clients in the small and mid-sized business market, specializing in employee benefits, major medical (HSA), and workplace coverage (dental, vision, etc.). She also works with owners regarding business continuity (buy-sell and key-person life and disability policies).